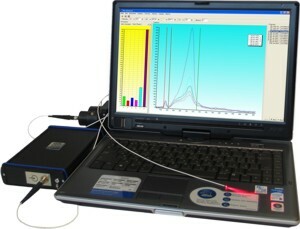 Spectroscopy system LESA-01-BIOSPEC allows in vivo locally determination of photosensitizer accumulating level in any patient's organs and tissues accessible for fiber optic probe. System is used during photodynamic therapy of intracavity, interstitial and superficial tumors. Optical properties of the system are optimal for using during photodynamic therapy with HPD (hematoporphyrin derivatives), 5-ALA (Aminolevulinic Acid), sulphuretted aluminum phthalocyanines and for measurements of biological tissues autofluorescence. User-friendly powerful software for Windows enables to compare accumulating of photosensitizer in affected and intact tissue. Useful facilities for tissue monitoring and drug accumulation analysis are provided. Spectroscopy system includes laser source for photosensitizer excitation and miniature spectrometer for registration and analysis of fluorescent signal. System may be built in embedded PC with touch screen and protected keyboard according to DIN41494 standard for 19" rack mounting. Modifications of LESA for oxygenation degree monitoring and absorption measurements as well as general purpose laboratory spectrum analyzer are available.